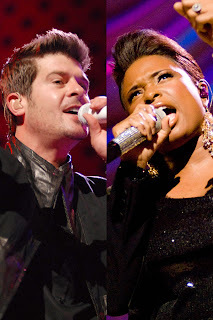 Robin Thicke ooohed and wooed the woman in the audience and Jennifer Hudson was glad to be in her hometown Chicago with family. Jennifer Hudson performed at the Arie Crown Theater on Saturday, April 25, 2009. This is the first time the Academy and Grammy Award Winner by way of American Idol, came back to her home town of Chicago as a headliner, selling two nights. Only about a half a year ago she lost her mother, brother and young nephew to tragedy. Early on in the show, Hudson welcomed her family and many were in attendance. Hudson and Thicke have been on tour for much of the month. Robin Thicke had women in the audience flooding the front and dancing along. Somewhere along his performance, Thicke threw out a towel or piece of clothing to one of the young ladies in the front row causing jealousy among the other female attendees. Majority of Thicke's songs were welcomed with high cheer and woo.